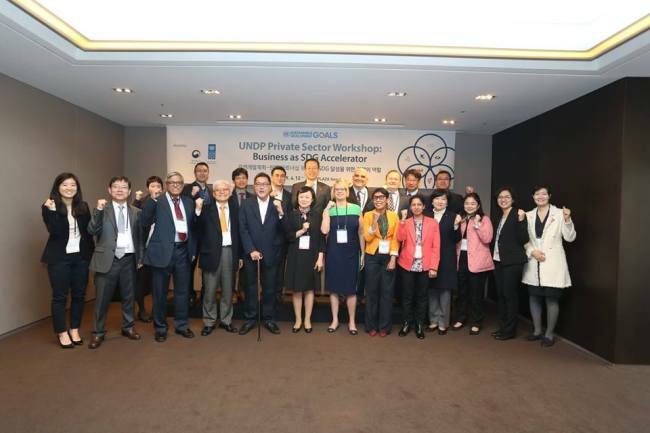 The United Nations Development Program’s Seoul Policy Center held a workshop for South Korean companies to help them contribute to and benefit from global sustainable development initiatives in more strategic ways. The conference, titled “Private Sector: Business as SDG Accelerator Workshop” and co-hosted by the center and the Ministry of Foreign Affairs, took place Friday in Seoul. The sustainable development goals, or SDGs, are targets set and adopted by all UN member states in January 2016. The 17 interdependent SDGs address global challenges such as poverty, inequality, climate change, peace and justice. Executives from Korean companies and corporate foundations took part in the event along with government officials, high-level UNDP representatives and representatives of business intermediary institutions. “The private sector is not just a participant in the Sustainable Development Goals -- it has the potential to be a catalyst and accelerator of sustainable development around the world,” Valerie Cliff, deputy regional director for Asia-Pacific at the UNDP, said in a press release. To achieve the goals by the target year of 2030, action is necessary on the part of all developed and developing countries, as well as governments, civil society and academia. Another key partner in the achievement of the SDGs is the private sector, the UN agency said. “If the private sector’s tremendous potential can be connected to realizing the SDGs, the impact on employment, economic growth and innovation in developing countries will be enormous,” said Lee Kyung-ah, deputy director general of the Foreign Ministry’s development cooperation bureau.